The acromioclavicular joint is a plane type synovial joint. It is located where the lateral end of the clavicle articulates with the acromion of the scapula. The joint can be palpated during a shoulder examination; 2-3cm medially from the ‘tip’ of the shoulder (formed by the end of the acromion). In this article, we shall look at the anatomy of the acromioclavicular joint – its articulation, ligaments, neurovascular supply, and any clinical correlations. Fig 1.0 – Articulating surfaces of the AC joint. The articular surfaces of the joint are lined with fibrocartilage (as opposed to hyaline cartilage). The joint cavity is partially divided by an articular disc – a wedge of fibrocartilage suspended from the upper part of the capsule. The joint capsule consists of a loose fibrous layer which encloses the two articular surfaces. It also gives rise to the articular disc. The posterior aspect of the joint capsule is reinforced by fibres from the trapezius muscle. As would be expected of a synovial joint, joint capsule is lined internally by a synovial membrane. This secretes synovial fluid into the cavity of the joint. 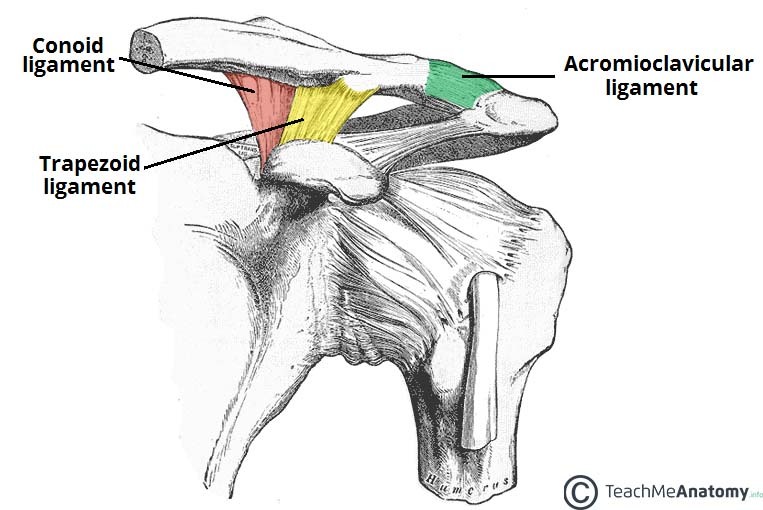 Acromioclavicular ligament – runs horizontally from the acromion to the lateral clavicle. It covers the joint capsule, reinforcing its superior aspect. Conoid ligament – runs vertically from the coracoid process of the scapula to the conoid tubercle of the clavicle. Trapezoid ligament – runs from the coracoid process of the scapula to the trapezoid line of the clavicle. Collectively, the conoid and trapezoid ligaments are known as the coracoclavicular ligament. It is a very strong structure, effectively suspending the weight of the upper limb from the clavicle. Fig 1.1 – The ligaments of the AC joint. Suprascapular artery – arises from the subclavian artery at the thyrocervical trunk. Thoraco-acromial artery – arises from the axillary artery. The veins of the joint follow the major arteries. The acromioclavicular joint is innervated by articular branches of the suprascapular and lateral pectoral nerves. They both arise directly from the brachial plexus. 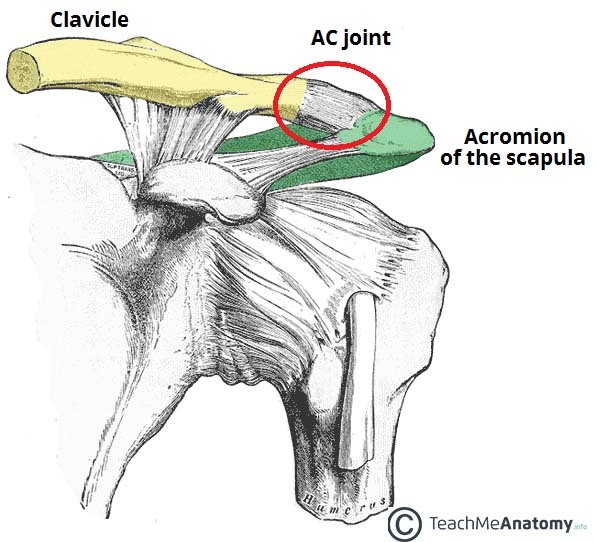 The acromioclavicular joint allows a degree of axial rotation and anteroposterior movement. As no muscles act directly on the joint, all movement is passive, and is initiated by movement at other joints (such as the scapulothoracic joint). 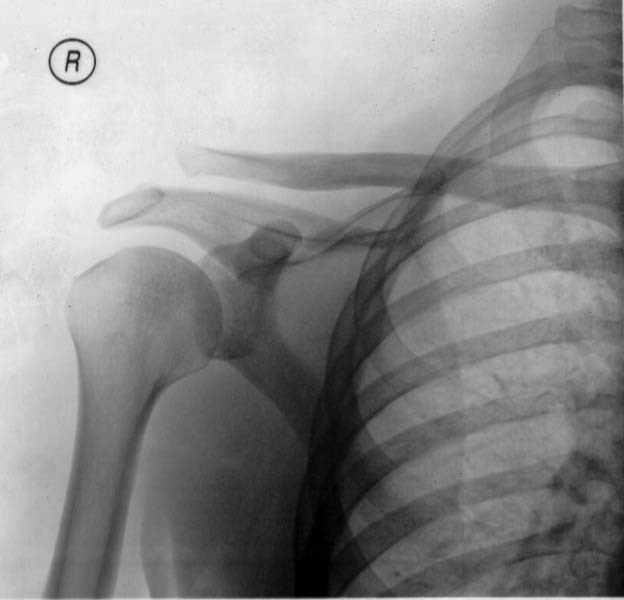 Fig 1.2 – Radiograph of shoulder separation. Acromioclavicular joint dislocation (also known as a separated shoulder) occurs when the two articulating surfaces of the joint are separated. It is associated with joint soft tissue damage. It commonly occurs from a direct blow to the joint, or a fall on an outstretched hand. The injury is more serious if ligamental rupture occurs (acromioclavicular or coracoclavicular). If the coracoclavicular ligament is torn, weight of the upper limb is not supported, and the shoulder moves inferiorly. This increases the prominence of the clavicle. Management of AC joint dislocation is dependent on injury severity and impact on quality of life. The treatment options range from ice and rest, to ligament reconstruction surgery. Note: this injury is not to be confused with shoulder dislocation – an injury affecting the glenohumeral joint. Which ligament corresponds to the label ‘A’ in the illustration below? What type of synovial joint is the acromioclavicular joint? 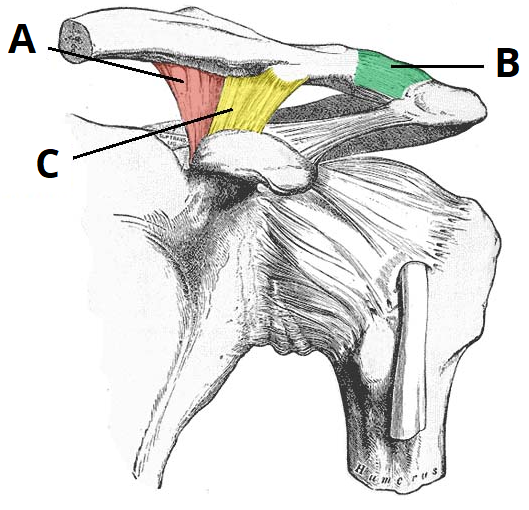 Which of the following is NOT an intrinsic or extrinsic ligament of the acromioclavicular joint?